François-Auguste Biard (1799–1882), Magdalena Bay; View from the Tombeaux Peninsula, to the North of Spitzbergen, Effect of the Aurora Borealis (c 1841), oil on canvas, 130 x 163 cm, Musée du Louvre, Paris. Wikimedia Commons. The Paris Salon in 1841 was agog at the paintings of an artist who has been almost completely forgotten today. 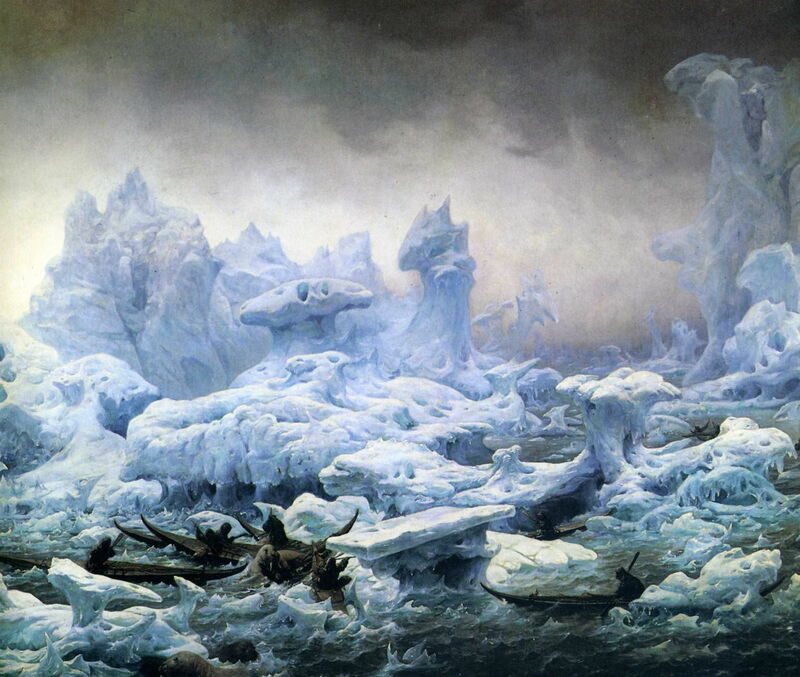 Three large canvases by François-Auguste Biard (1799–1882) transported the public to the Arctic wastes of Spitsbergen, the coast of Greenland, and river rapids in northern Finland. Biard was the talk of Paris. Biard was born in Lyon, France, and trained at the Academy of Fine Arts there, before making his way to Paris in 1824. He quickly got itchy feet and a compulsion to travel, and in 1827-28 he was the teacher of drawing on board a training ship, which visited Greece and the Middle East. He made quite a reputation for himself at this stage, and when he settled back in Paris in the mid 1830s he was appointed portrait painter to the court. 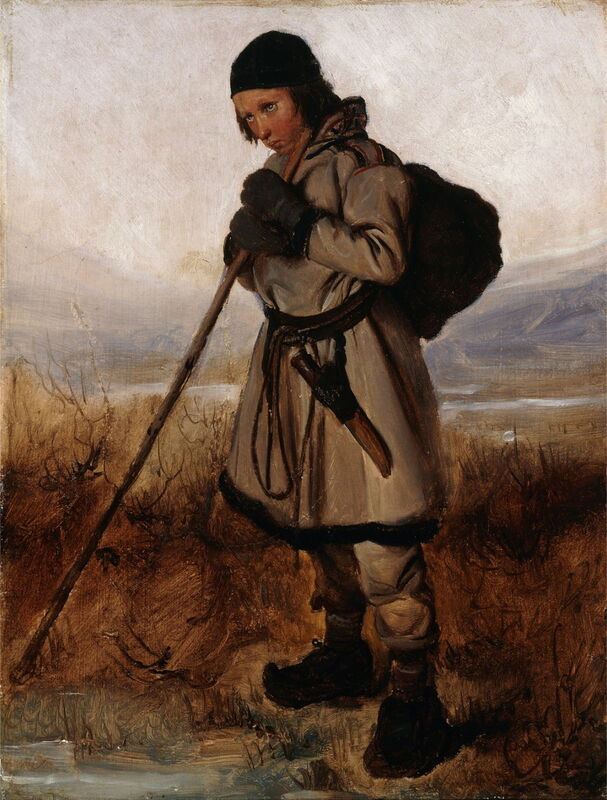 His lust for travel could not be quelled, though, and in 1839 he left France to act as unofficial artist to the Le Recherche French Admiralty expedition which went into the far north, to the remote island of Spitsbergen. The rest of the expedition had left Le Havre, France, in the summer of 1838 on a French corvette, and headed for the north of Scandinavia. Led by Joseph Paul Gaimard, a zoologist, it was primarily scientific in aim, and took with it a Sami minister and botanist Lars Levi Læstadius, and some notable scholars. The expedition also visited the Faroe Islands, Iceland, and the coast of Greenland, returning to France in 1840. Biard financed his own travel to join the expedition in northern Norway. He was accompanied by an eighteen-year-old woman, Léonie d’Aunet, whom he later married, and who also became the mistress of Victor Hugo. The couple travelled through northern Europe and Scandinavia to join the expedition at Hammerfest, from where they sailed for Spitsbergen in July 1839, almost a year after the ship had left Le Havre. They sailed for two weeks to reach Magdalena Bay, where they anchored for thirteen days to carry out the scientific programme. The ship then returned to northern Scandinavia, where Biard and d’Aunet left to explore Lapland before returning to France. 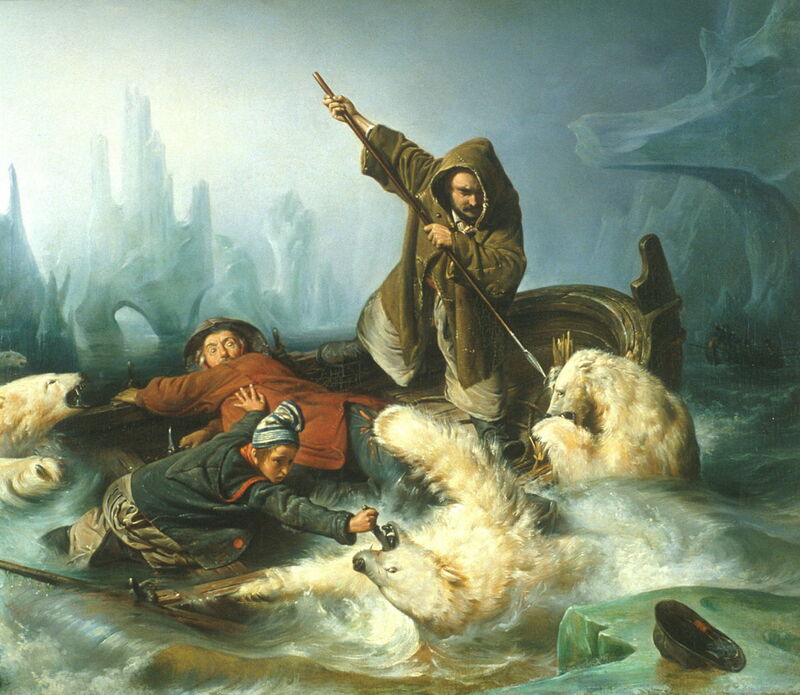 François-Auguste Biard (1799–1882), Fight with Polar Bears (1839), oil on canvas, 50 × 62 cm, Nordnorsk Kunstmuseum, Tromsø, Norway. Wikimedia Commons. 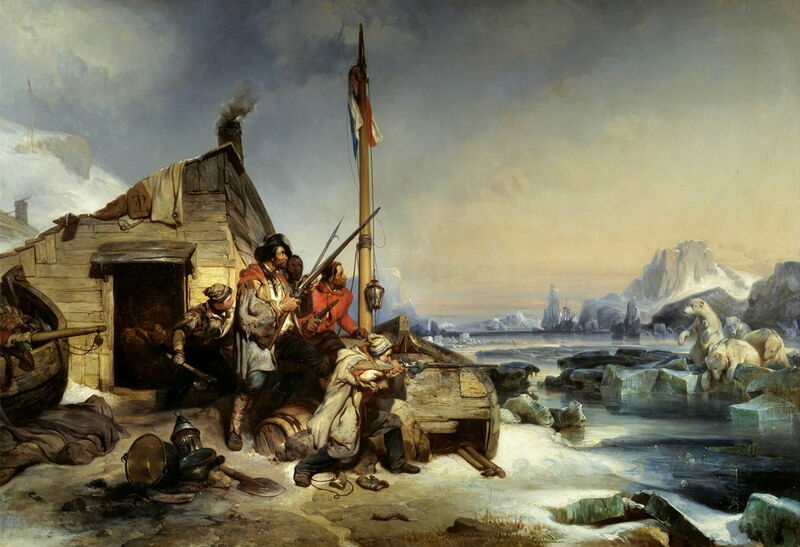 Biard’s most famous painting from this time is this gripping depiction of a Fight with Polar Bears, completed just prior to his departure on the expedition, and exhibited at the Salon in 1839. It is sometimes assumed that this shows a real or dramatised episode from the expedition, but it was painted before he had even left France. Two men and a boy are in a small boat, which is being attacked by three adult polar bears. They are trying to repel them using a spear-like harpoon, a hand knife, and an axe, as the bears are threatening to overwhelm their small boat and wound them. François-Auguste Biard (1799–1882), Pastor Læstadius Instructing the Lapps (1840), oil on canvas, 131 × 163 cm, Nordnorsk Kunstmuseum, Tromsø, Norway. Wikimedia Commons. Pastor Læstadius Instructing the Lapps (1840) shows the expedition’s botanist and priest preaching among the Sami people in Lapland. Læstadius was a self-identified Southern Sami, through his mother, and a revivalist Lutheran. One of his main missions was to tackle the severe problems brought by alcohol, and convince the Sami people to become teetotal. He spoke two Sami languages, and during his ministry collected Sami myths which were sadly left unpublished until 1997. François-Auguste Biard (1799–1882), A Laplander (date not known), oil on paper mounted on cardboard, 38.7 × 30 cm, Private collection. Wikimedia Commons. Biard’s undated full-length portrait of A Laplander was sketched on paper using oils, as seen in its background. François-Auguste Biard (1799–1882), Magdalena Bay; View from the Tombeaux Peninsula, to the North of Spitsbergen, Effect of the Aurora Borealis (c 1841), oil on canvas, 130 x 163 cm, Musée du Louvre, Paris. Wikimedia Commons. 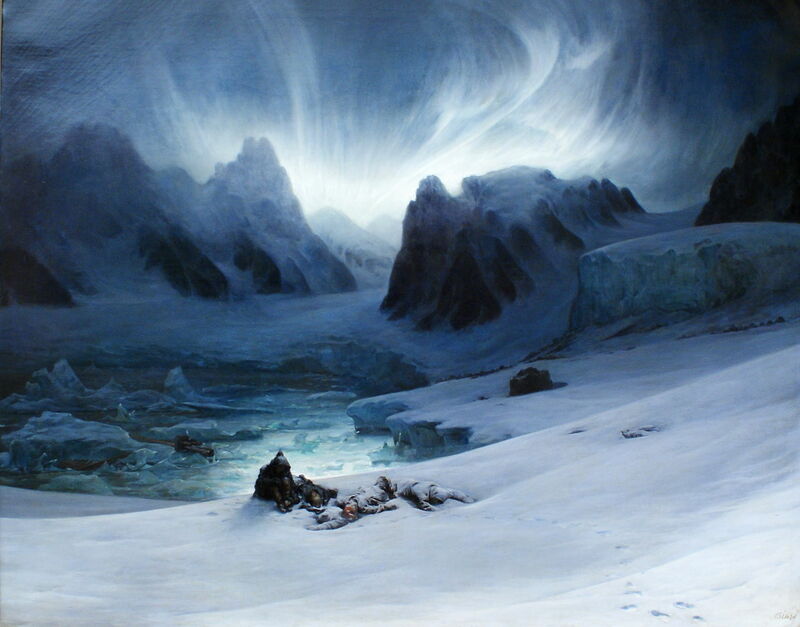 Magdalena Bay; View from the Tombeaux Peninsula, to the North of Spitsbergen, Effect of the Aurora Borealis was probably completed in 1841, and was exhibited in the Salon of that year, and again at the Exposition Universelle in Paris in 1855. Lit by the eery light of the aurora is a small group of survivors, who are not mentioned in the title. Five rest on the snow in the foreground, all but one apparently already dead, and there is wreckage down among the ice behind them. One person’s footsteps lead up to the viewpoint of the artist. François-Auguste Biard (1799–1882), View of the Arctic Ocean, Walrus Fishing by Greenlanders (1841), oil on canvas, Château-Musée de Dieppe, Dieppe, France. Wikimedia Commons. 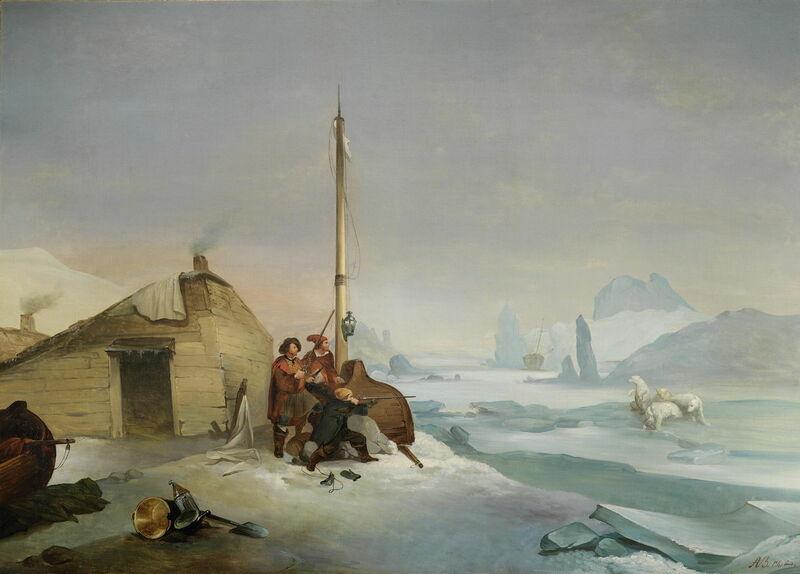 View of the Arctic Ocean, Walrus Fishing by Greenlanders was also completed in 1841 and exhibited at the Salon of that year, and again at the Exposition Universelle in Paris in 1855. In a wild landscape of bizarre ice forms, a group of Inuit hunters in their kayaks are confronting huge walrus. François-Auguste Biard (1799–1882), Nova Zembla Coast (1841), oil on canvas, 120 × 165 cm, Private collection. Wikimedia Commons. Biard also painted the coast of Novaya Zemlya, a huge and almost unpopulated archipelago off the north coast of Siberia, well to the east of the Svalbard archipelago which includes Spitsbergen. I suspect that this painting of Nova Zembla Coast (1841) was made from a published account of a group of Dutch sailors, as a very similar composition was painted a couple of years earlier by Biard’s contemporary Eugène Lepoittevin (1806-1870), under the title Overwintering of a Team of Dutch Sailors on the Eastern Coast of Novaya Zemlya (1839), shown below. 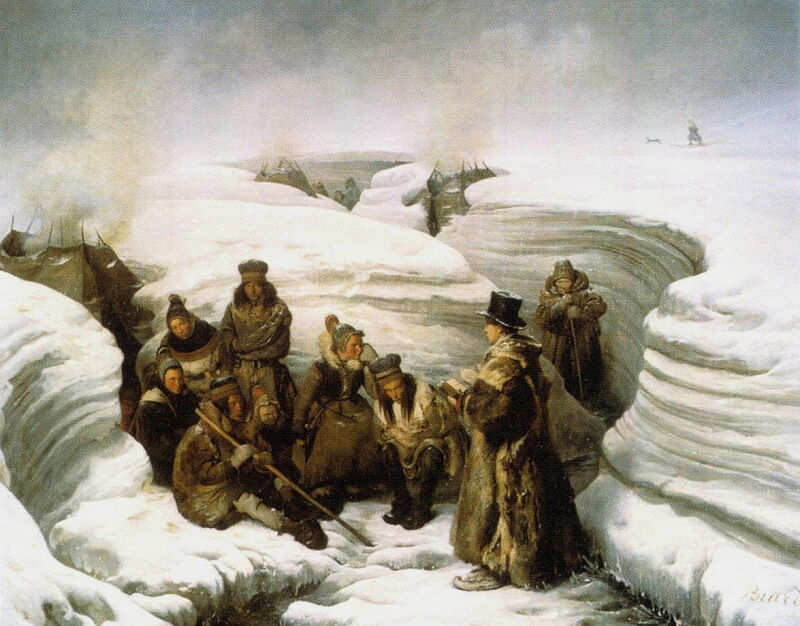 Eugène Lepoittevin (1806-1870), Overwintering of a Team of Dutch Sailors on the Eastern Coast of Novaya Zemlya (1839), oil on canvas, 108 × 156 cm, Musée départemental de l’Oise, Beauvais, France. Wikimedia Commons. Biard’s success in capturing the public imagination was rewarded by several commissions for related paintings. Among them is a series of large canvases for King Louis Philippe’s palace at Versailles, showing the Duke of Orleans during his visit to Lapland in the summer of 1795. François-Auguste Biard (1799–1882), The Duke of Orleans Riding Down the Great Rapid of Eijanpaikka at the Muonio River, Lapland, August 1795 (1840), oil on canvas, 131 × 163 cm, Château de Versailles, Versailles, France. Wikimedia Commons. 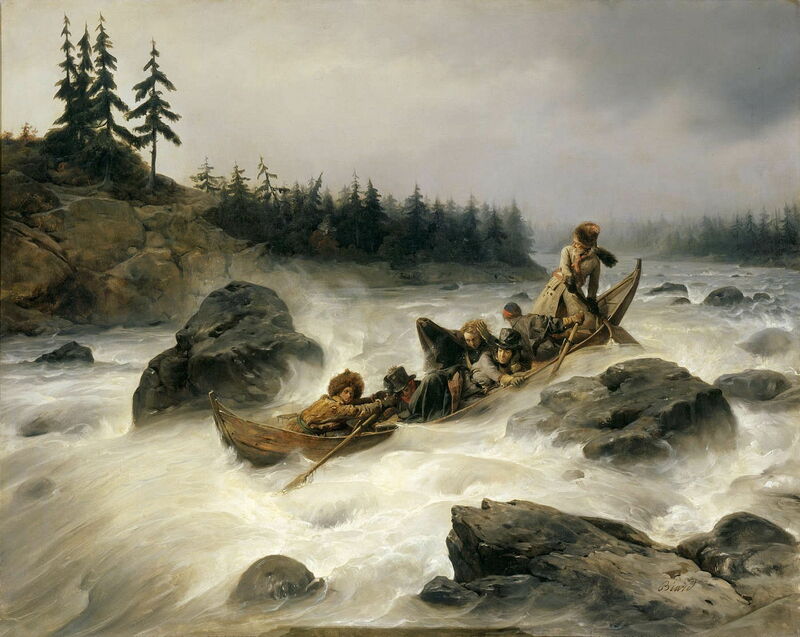 The Duke of Orleans Riding Down the Great Rapid of Eijanpaikka at the Muonio River, Lapland, August 1795 (1840) shows the Duke enjoying a little white water canoeing, and was exhibited at the Salon in 1841. Biard’s depiction of the water is particularly interesting here, as this long predates photography, which much later was able to use short exposures to effectively freeze motion. François-Auguste Biard (1799–1882), The Duke of Orleans Received in a Lapland Camp, August 1795 (1841), oil on canvas, 132 × 163 cm, Château de Versailles, Versailles, France. Wikimedia Commons. 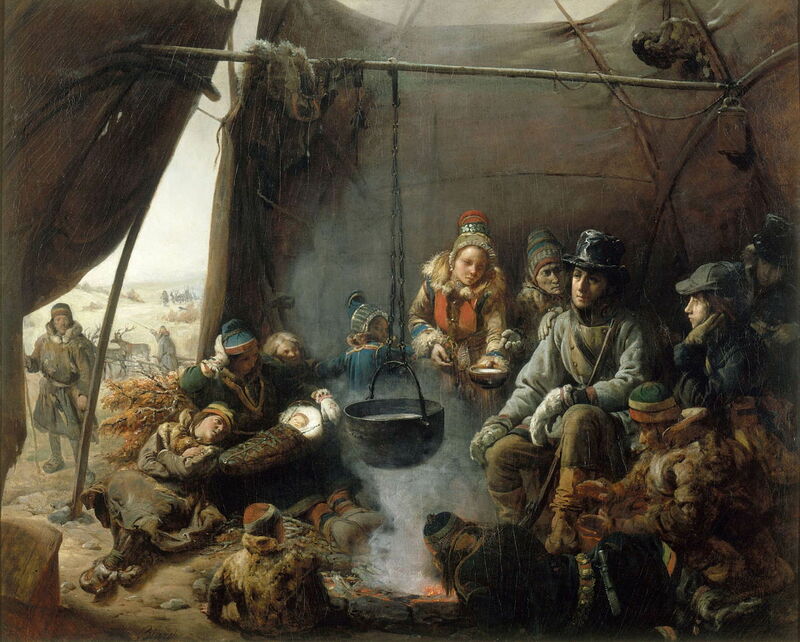 The Duke of Orleans Received in a Lapland Camp, August 1795 (1841) shows the Duke looking rather disdainful and isolated in a Sami tent, apparently shunning the bowl that is being offered to him. The next article will look at Biard’s other paintings, particularly those of more tropical countries. Barbara C Matilsky (1985) François-Auguste Biard: Artist-Naturalist-Explorer, Gazette des Beaux-Arts, February 1985, vol 105, pp 75-88. Posted in General, Life, Painting and tagged Arctic, Biard, landscape, Lepoittevin, painting. Bookmark the permalink.